I’ve been trying to make the Azure Stack Proof-of-Concept (Preview 2) run on VMware and here is what I found. 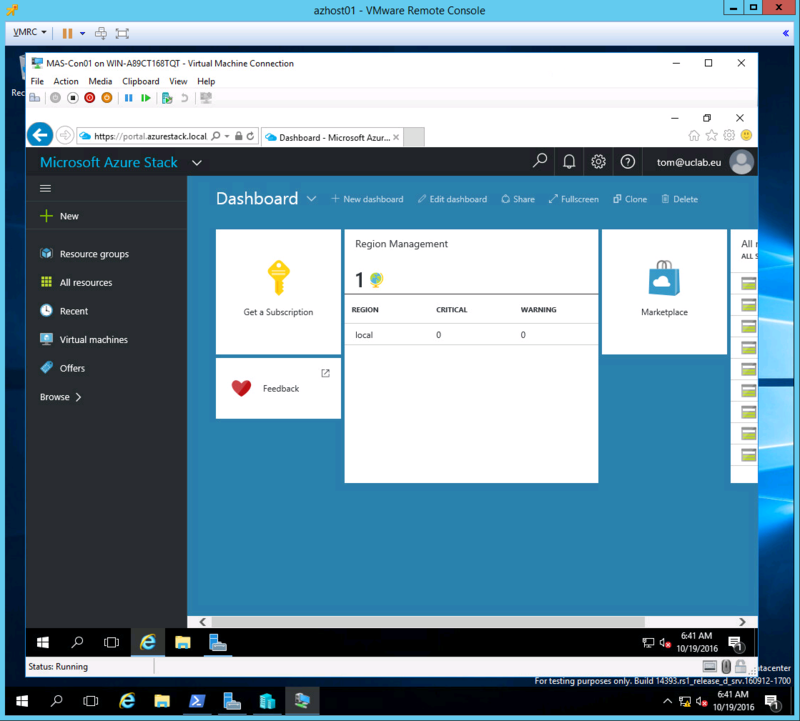 As I currently run VMware in my lab and didn’t want to re-install the physical server, I tried to get the Azure Stack up and running in a VMware VM. Following the recommendation for sizing, I created a VM with 100GB of RAM, 24 vCPUs, one vNIC and 5 hard disks with 200GB each. The many vCPUs are actually not necessary, as the hardware check does fail even though enough cores should be available. More on that later. Note in the above example I’m using a distributed virtual Port Group. For a standard virtual Port Group use Set-SecurityPolicy. Write-Host "The server is currently already booted from a virtual hard disk, to boot the server from the CloudBuilder.vhdx you will need to run this script on an Operating System that is installed on the physical disk of this server." Now either remove the section or just remove the Exit. That way, it will still display a warning but no longer stop the execution of the script. Again, start .\PrepareBootFromVHD.ps1 -CloudBuilderDiskPath which should now succeed and prompt for a reboot of the machine. The VM restarts and boots from the CloudBuilder.vhdx file with the typical OOBE asking for an admin password and the product key. Once set, startup continues and we can log-in to the VM. At this point, we’ll have to install the VMware tools again. The next step is to initialize the additional hard disks for the machine. The disks must be “empty” so do not create any volumes. I just run Get-Disk | Initialize-Disk and move on. Test Failed: Validate that the computer 'WIN-MUTSIQJMO43' is a physical machine. Test Failed: Validate that at least 12 cores are available in computer WIN-MUTSIQJMO43. 2016-10-13 08:03:58 Verbose  Step: Status of step '(DEP) Validate Physical Machines' is 'Error'. So the two tests that failed use the following CIM Instances (WMI) to query information about the host system: Win32_ComputerSystem, Win32_Processor Now even though I did configure 24 vCPUs for my VM, the NumberOfEnabledCore attribute of Win32_Processor shows a value of “0”. By the way, you’ll see that this script is signed, so in order to make it run, remove the signature and save the script. Note that at some point of the installation, the VM is rebooted and logged in automatically to the account “azurestack\azurestackadmin”. From that moment on, all installation related tasks (such as a -Rerun) should be performed using this account. Task failed with the following error: 'The WinRM client sent a request to the remote WS-Management service and was notified that the request size exceeded the configured MaxEnvelopeSize quota.'. 2016-10-13 13:48:18 Verbose  Step: Status of step '(NET) Configure NC on VMs' is 'Error'. If you encounter problems during installation, make sure to check the summary.log.xml file in C:\CloudDeployment\Logs.